The Jewels of the Cyclades showcases the Aegean Islands known for their whitewashed villages and ports, the bright skies and crystal sea. Visit the well known places of Santorini and Mykonos and off the beaten track islands such as Paros and Folegandros. The highlights of this program are the excursions in Santorini and Delos, nighlife in Mykonos, the old Greece atmosphere in Folegandros and swimstops in some secluded bays to swim from the boat. Athens is the capital and largest city in Greece, a bustling and cosmopolitan metropolis, which is rapidly becoming a leading business center in the European Union. As one of the world's oldest cities, its recorded history spans at least 3,000 years. Classical Athens was a powerful city-state. The heritage of the classical era is still evident in the city, represented by a number of ancient monuments and works of art, the most famous of all the Parthenon on the Acropolis. Embarkation between 2-3 pm. Enjoy a welcome drink and meet your crew and fellow passengers. Sail for Poros for a short 3 hours visit, before set sail to Poliegos. Overnight at sea. Morning arrival in Poliegos, a very small island known for its amazing beaches. The island lies in close proximity to the Peloponnesian coast, separated by a narrow channel. Is an extremely picturesque and aristocratic island blessed with sheer natural beauty and bearing unique nobility. Enjoy a morning swim stop followed by a BBQ on deck. This afternoon, sail to Folegandros - one of the most amazing and less known islands in the Aegean Sea. It has three small villages, Chora, Karavostassis and Ano Meria, which are connected by a paved road. Folegandros is a relatively quiet island paradise, that is maintained to keep its local atmosphere untouched by mainstream tourism. Walk the amazing Upper city and dine at one of the traditional Greek tavernas. One of the highlights cruising the Cyclades is of course the volcanic island Santorini or Thera, with the biggest caldera of the world surrounded by Thera and Therassia as well as a small islet called Aspronisi (White Island), which are the remains of the origin volcanic island risen in about 80000 BC. Today’s shape of the island is a result of a huge eruption followed by a catastrophic explosion in the 16th cen. BC, which had destroyed this island and the city of the Cycladic Civilization. Enjoy a morning arrival at Santorini to explore its unique capital Fira. 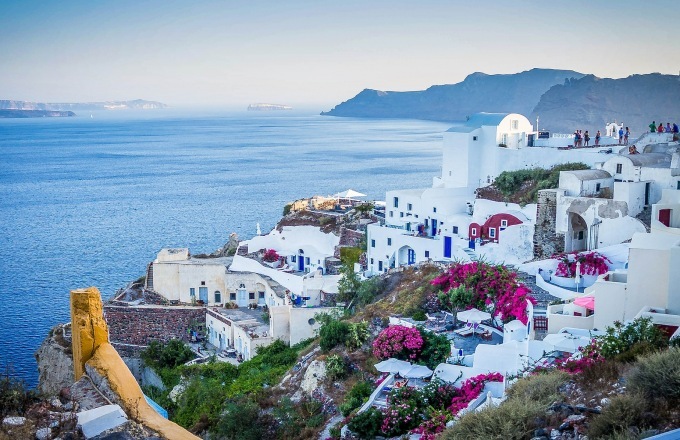 Optional Excursion to Akrotiti excavations and a tour of the villages including the small beautiful village of Oia know for it’s breathtaking view over the caldera. Overnight in Santorini. In the morning, enjoy a swim stop in an enchanting bay of Antiparos. Early noon arrival in Paros. Visit Parikia and the quaint village of Naoussa. Time to have a fun night and show us your dancing skills during our famous Greek Night. Overnight in Paros. The Island of Delos lies in the middle of the Cyclades, 3.5sqm from Mykonos. Except for the guards and the guides the island is not inhabited. According to the Greek Mythology, Leto haunted by jealous Hera had found asylum on this island to give birth to Zeus’ children, Apollo and Artemis. Apollo became one of the most important gods and so Delos became a great sacred place for worshiping him up to the Roman times. In 1872 the French Archaeological School started with systematic excavations, which still continue today together with the Greek Archaeological School. Optional morning tour to the unique archaeological site of Delos, antiquity’s most sacred island. Later on, stop at one of Mykonos beautiful bays for swimming off the ship before sailing into Tourlos port in Mykonos. The island of the jet setters is yours to explore and the night is young. Overnight in Mykonos. After a morning swim, arrive in Syros - the capital of the Cycladic islands, where you can enjoy one of its beautiful sandy beaches or walk through town and enjoy the unique architecture of the buildings. Syros lies in the middle of the Cyclades between Kythnos and Tinos. Syros like the other Cycladic islands was inhabited from the early prehistoric times. Syros, was the largest cultural and trade center of the Aegean in the 19th century and capital Ermoupolis was Greece's principal port. From the time of the Fourth Crusade (13th Century) until 1568 Syros belonged to the Duchy of Naxos. After that period the island had a significant Roman Catholic minority which was under the protection of France from piracy and during the Turkish occupation. Overnight in Syros. Disembark after breakfast and transfer to the airport for flights home. The 167-foot, 49-guest Galileo is a classic steel-hull motor sailer cruising the Greek Isles. You'll enjoy the best of the Mediterranean - sun, sea, sand and history - aboard this stunning vessel built with the most stringent safety regulations. Galileo's spacious and well appointed interiors were renovated in 2007. The lounge area is located on the main deck and has large windows providing for magnificent views. The lounge is a spacious, warm and cozy area with an American bar. The spacious sun deck is equipped with sun beds, deckchairs and shaded areas. Guests on Galileo enjoy the most the shaded outdoor deck area with and outdoor bar were they can just relax enjoying the most breath taking sea views. Kayak and snorkel equipment are available for the adventurous. Nor do they include items of a personal nature such as alcoholic beverages, soft drinks, gratuities, gift shop purchases, medical services, phone calls, etc. Our level one trips are designed for travellers interested in lodge and hotel accommodations combined with mild activities, plenty of flexibility and options for more rigorous activity. Expect two to four hours of activity each day over straightforward terrain. Travellers should be comfortable hiking or walking 3-5 miles per day. Other level one activities include snorkelling or sea kayaking sheltered waters and river rafting class I-II water. Expedition Cruising aboard small ships and yachts is level one and may include fun and easy activities such as hiking, snorkelling and kayaking. Enjoying a relaxed pace with a focus on nature, culture and history is often a priority for those who choose this trip level.